The conference NOT NOW! NOW! focuses on chronopolitics. 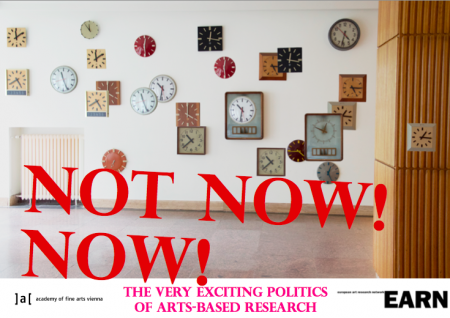 While the field of temporality studies is relatively wide, the conference will lay special emphasis on the question of the temporal politics in the field of art. The conference departs from the premise that artistic practices are considered a productive means to challenge orderly and rigid temporal concepts and their effects on bodies andthe organising of the social: How exactly and by which formats andmethods can artistic practices intervene into normative, “straight,” linear and normalizing concepts of time? A specific selection of exemplary art works as well as recent debates in postcolonial andqueer studies will be the starting points for our commondiscussions. Lectures by: Sharon Hayes (New York), Mathias Danbolt (Kopenhagen), Nana Adusei-Poku (Berlin), Jamika Ajalon (London, Suzana Milevska (Skopje / Wien). “Exhibition” with works by: Sharon Hayes, Ana Hoffner, Anna Tzini, Henriette Heise, Xiaoyan Men, Tanya Ostojic. The conference starts on Thursday, October 17, at 3pm and continues on Friday, October 18. It all happens on Schillerplatz 3, 1010 Vienna, Aktzeichensaal (conference) / Aula (exhibition). Detailed program here.